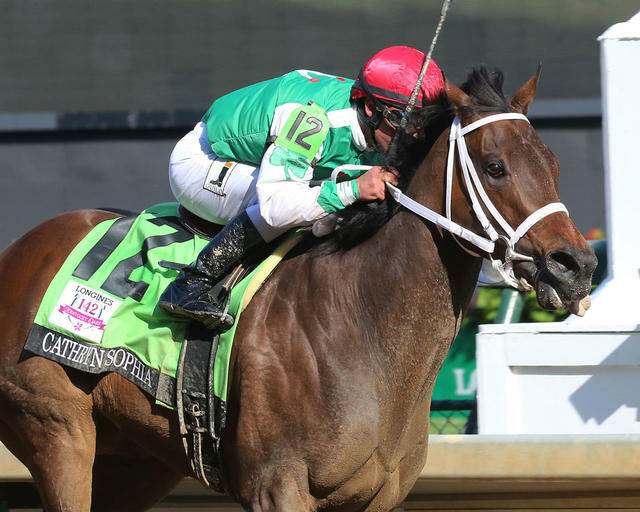 Cash is King LLC’s Cathryn Sophia returned to the winner’s circle in stellar fashion on Friday when capturing the 142nd running of the Kentucky Oaks (G1) at Churchill Downs. Trained by John Servis and ridden by Javier Castellano, the bay filly broke free from the field in midstretch and pulled away to stop the clock in 1:50.53 over the fast main track. Sent off the 9-2 second choice to 5-2 favorite Rachel’s Valentina, Cathyrn Sophia paid $11.40 for the win. Land Over Sea, Lewis Bay, Go Maggie Go and Mo d’Amour came next in a blanket finish in that order. Cathryn Sophia improved her career record to read 6-5-0-1, having just suffered her first loss in the Ashland (G1) on April 9. Prior to that she captured the Gin Talking S. at Laurel Park and Gulfstream Park’s Forward Gal (G2) and Davona Dale (G2).